The south-west monsoon has arrived in most of India as per the India Meteorological Department (IMD). According to the IMD, the monsoon made rapid progress in the last few days and due to this it has landed well in advance in the northern plains of India, in spite of significant delays in its schedule before. 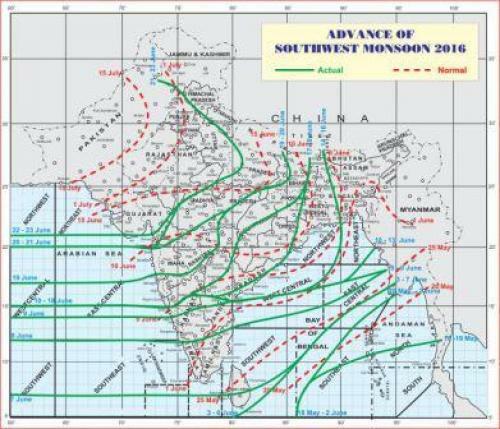 As of June 24 afternoon, the northern limit of the monsoon passes through the northern Arabian Sea, parts of Gujarat, Madhya Pradesh, Uttar Pradesh, Uttarakhand, Himachal Pradesh and Jammu and Kashmir. It is yet to reach most of Gujarat, Rajasthan, Punjab, Haryana, Chandigarh, Delhi and the National Capital Region (NCR). But the real feel of the monsoon is still missing in many areas due to which people are thinking whether the monsoon has really arrived or not. A very prominent observation they have made is that despite the monsoon’s arrival, temperatures in many areas are still on the higher side, there is sunshine for most of the day and it rains only during the night. This is completely opposite of what is generally observed during an active monsoon, during which temperatures are on the lower side due to rain and clouds and it rains during the day. It does not rain every day in the monsoon season, but generally monsoon-like conditions are persistent for a while when the monsoon moves in a region. Normally from central India, the monsoon takes around 15-20 days to reach Jammu and Kashmir, but this time it covered this journey in practically one to two days, thus making this year’s monsoon’s progress bizarre. The IMD is now planning to declare monsoon’s arrival in the remaining parts (which also include the Delhi-NCR) by June 28 where temperatures are still high and rainfall-wind patterns highly improper. Thus, as was anticipated, the IMD seems to be in a hurry for declaring the monsoon’s arrival in India. Monsoon’s progress at a lightning speed does not seem to have improved the overall rainfall situation. India has received a rainfall which is 17 per cent below its average for the period from June 1 to June 23, 2016. 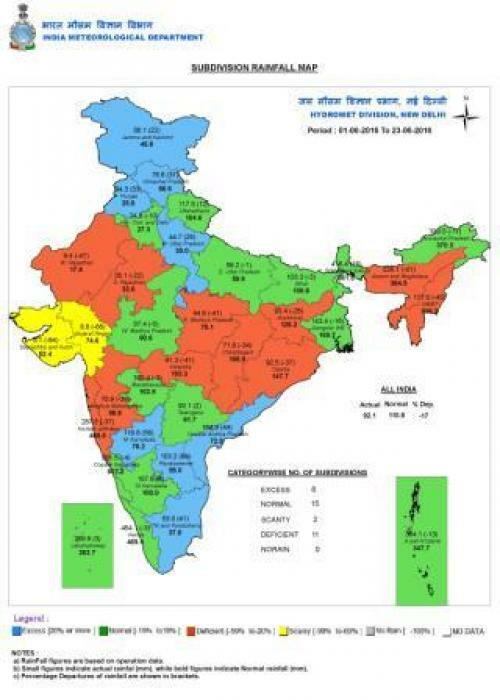 As can be seen from the above image, there are still 11 sub-divisions where deficient rainfall has been recorded. Most of these are where the monsoon has arrived and they belong to central and eastern India. Undoubtedly, monsoon’s arrival is one of the most celebrated events in India. It boosts kharif sowing activities. But farmers of Maharashtra are also confused because of the monsoon’s arrival news. “Getting the news of monsoon’s arrival in Vidarbha on June 17, I did cotton sowing on my field. However, it didn’t rain after that, the weather opened up, due to which temperatures went up. This has caused a sowing failure and tremendous economic losses,” Nandu Kanhere, a farmer based in Hingna Tehsil of Nagpur district of Maharashtra, said. Nandu is not the only farmer, who did sowing after getting the news of monsoon’s arrival. There are so many farmers like him who went for sowing, hoping that it will rain properly as the monsoon has arrived but it did not. Many farmers from the village are now planning to go for a third-time sowing as previous two rounds have failed due to the deceptive nature of rains and unusual monsoon onset. Many are even blaming the IMD and the news agencies for giving misleading monsoon news. What’s wrong with monsoon’s progress? The real problem is because of two things. First of all monsoon’s arrival is a vague term and everyone sees this event from their respective viewpoints. Unlike the case of Kerala, the IMD does not follow any criteria to declare monsoon’s progress in the rest of India and this declaration is a subjective matter. For the farmers, monsoon’s arrival means heavy and sowing sufficient rainfall window whereas for the common man (non farmers), it means two to three days of overcast sky with rains and cooler weather. That is where the clash is. The night-time rainfall being witnessed by the people of Madhya Pradesh, Maharashtra and Uttar Pradesh reminds me of a statement given by a senior IMD officer on the difference between monsoon and pre-monsoon showers. The pre-monsoon showers are mostly due to thunderstorms which form due to pre-monsoon moisture, daytime heating and atmospheric instability. They form in the afternoon hours and the rainfall is witnessed only in the evening/night hours. The most important feature of the monsoon’s progress declared by the IMD is that proper westerly or south-westerly monsoon winds from the Arabian Sea are missing over the majority of areas in India. The above image shows a comparison between the observed winds (left part) and how they normally should be (right part). The encircled region shows the absence of proper monsoon winds. We must not forget a basic fact that not every rain is a monsoon rain and the wind factor is equally important when it comes to a declaration of the monsoon’s progress. Over the last few days, strong pre-monsoon thundershowers have been happening in eastern, central and parts of northern India and considering this rainfall as monsoon rainfall, the IMD declared the monsoon’s progress in majority of India. The IMD is stating that this time the Arabian Sea branch is weak and the monsoon’s progress is mainly due to the Bay of Bengal branch (monsoon over the Indian subcontinent has two branches—the Arabian Sea branch and the Bay of Bengal branch), but even there are not any proper monsoon winds from the Bay of Bengal. Winds and observed rainfall patterns suggest that the monsoon has covered areas till Konkan of Maharashtra, Karnataka, Andhra Pradesh, north-eastern states and a couple of eastern states of India. It is yet to advance properly in the remaining areas, and hence, it is incorrect to declare the monsoon’s widespread arrival. There is a need for implementing a proper set of criteria for declaring monsoon’s arrival in the rest of India so that it no longer remains ambiguous and a subjective matter. The off-shore trough (elongated low-pressure region running parallel to the west coast of India) will be strengthening this weekend, and hence, coastal Maharashtra will get heavy rainfall including Mumbai between Friday and Sunday. The greatest impacts would be on Saturday due to which Mumbai can witness the typical rain-related disruptions. Landslides too are possible in the hilly areas of coastal Maharashtra. With this, the “proper monsoon” will be advancing in Mumbai. In the coming week, a couple of thundershowers are expected in north and central India, but proper monsoon winds are expected to be established over India from next week only and this is when proper monsoon will start making progress. 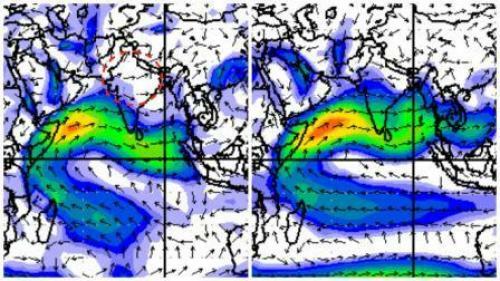 Will the monsoon reach Kerala on time?